The PFIAO is inviting applications for this full-time study opportunity. 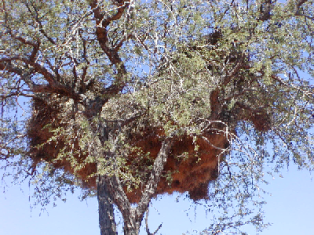 The MSc student will investigate cooperative behaviour in sociable weavers Philetairus socius near Kimberley, South Africa. This study will investigate the role of dominance and sexual selection in cooperation and conflict resolution in the Sociable Weaver. The study will involve extensive behavioural observations to establish dominance hierarchies and whether there is social segregation or competition for access to specific communal tasks (such as helping at the nest or nest-building activities). The successful applicant will have a BSc Honours or equivalent, relevant ornithological field experience and a demonstrated ability to work independently. The student should have a strong interest in pursuing theoretical questions in behavioural ecology and motivation for conducting demanding fieldwork. Experience in handling birds and behavioural observations are important advantages. To apply, please send a CV (including your academic record & names and contact details of three referees) and a short motivation for why you wish to undertake this research to Hilary Buchanan (hilary.buchanan [at] uct.ac.za). Closing date: 01 July 2011.